Standard Retractable Batting Cage by Victory Athletics, Inc. The standard retractable batting cage is our most popular and budget friendly batting cage. The net is stored on the top of the cage when not in use. In a few easy steps, you will be ready to play. 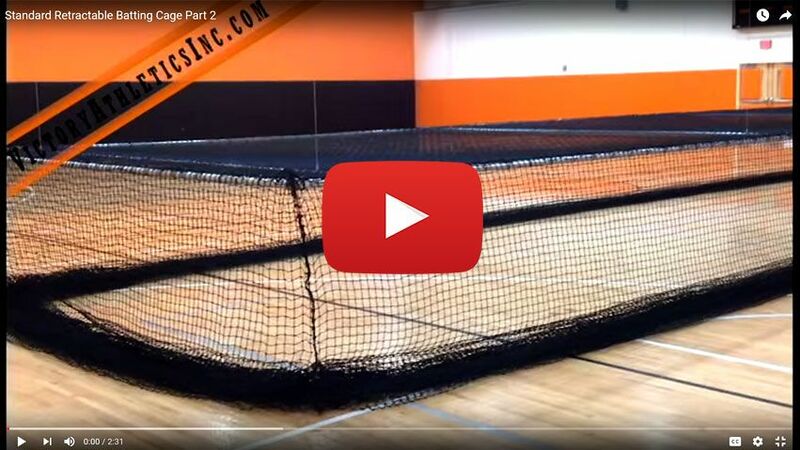 Lower the cage to 3’ from the floor and place the net on the top of the cage. Raise the cage to its pre-set storage position. If the standard system is what you are looking for, then fill out this questionnaire. Our engineer will then decide what type of standard system will be able to operate in your facility and if any additional brackets may be needed. Depending on your ceiling structure, the obstructions in your ceiling, and the overall size of your facility one of the batting cage systems below will be chosen by our engineer. Custom Standard Batting Cage Sizes are Available and Welcomed! This system is used mainly in a facility where the size of the cage is close to the same length as the area the cage would be positioned, or obstructions hinder installation. The Return-Pull system pulls a series of cables in two separate directions, allowing a 70’ long cage to be installed in a facility as long as 75’. These systems are required when there aren’t at least 2 trusses available for attachment points, or other obstructions prohibit the use of standard attachment procedures. The hardware components include tubing, wall or ceiling mounted brackets and two very taut cables to create a ceiling support structure needed for various lift points. This system uses a winch to drive a continuous 2 3/8” O.D. schedule 10 tubing that is the same length as the cage and is supported by a 1/4” laser cut bracket with (4) phenolic wheels on which the drive shaft rotates. The cage is lifted by 1/8” galvanized aircraft cable. The cables wind up on individual reels located on the drive shaft at each lift point on frame of cage. This system also used on single lane cages where ceiling obstructions do not permit any other system. Wireless remote transmitter allows you to operate a retractable batting cage system from anywhere in view of the batting cage. The transmitter provides the ability to eliminate expensive wiring cost from ceiling mounted winch motor to wall mounted key switch. Simply hook power to the winch and you are ready for operation. The wireless transmitter can be used on other gym equipment also. By purchasing additional receivers that can be programmed to operate on different channels. 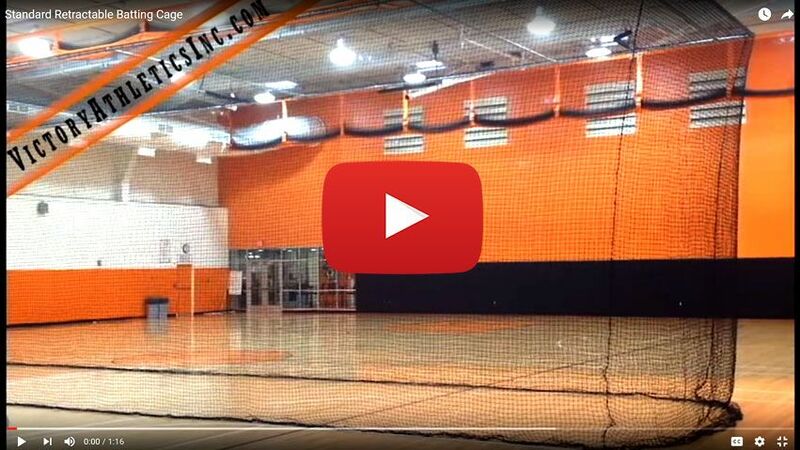 For example, batting cages can operate on display (1) and a divider curtain can operate on display (2). Up to 25 additional winch systems can be programmed. 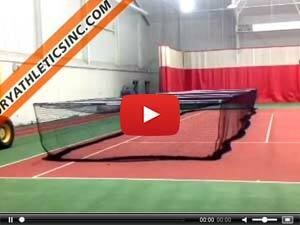 If you have watched the video above then you understand the savings benefit of a Standard Retractable Batting Cage. The savings are substantial over the Hands Free System if you don’t mind rolling up the net yourself. However, when you need a bit more speed, adding a frequency driven programmable high speed high torque winch to your configuration can get you moving in a hurry. The videos below show the speed increase to the standard retractable battle cage with the high speed option added. Please make sure to let us know you are interested in this option when filling out our questionnaire or when calling us toll free at (877) 337-7678. Victory Athletics, Inc. offers a complete, professional installation for any number of products. Our highly skilled installation technicians along with our mobile fabrication vehicle handle every job with the expertise you would expect from professionals. Depending on the style system, ceiling structure and the distance of your facility our installation services for our batting cage systems vary.